Michelin-starred south London restaurant Chez Bruce is set to close for six weeks in the summer as chef patron Bruce Poole plans to expand into the building next door. The restaurant on Wandsworth Common will close for the extension works on 19 July and will reopen at the end of August. The extra space will be used to add 20 covers to the restaurant, expand and upgrade the kitchen and add a disabled toilet. Poole signed a deal for the neighbouring site, a former post office which most recently operated as a café, two years ago but said the right time to do the extension work had not come around until now. 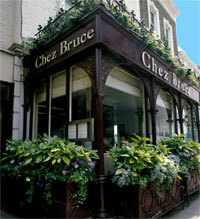 Poole confirmed that staff at Chez Bruce would be kept on during the works and either be able to take accumulated or unpaid leave or be found other work within the group, which comprises Michelin-starred London restaurants La Trompette in Chiswick and the Glasshouse in Kew.